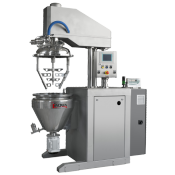 The CMC mixing unit is a skid designed for a fast dispersion of hydrocolloid products such as carboxymethylcellulose (CMC), flours, carbopol, pectin, and guar or xanthan gum. These additives are widely used in industry on account of their multiple properties: as thickeners, jellifying agents, stabilisers, complexing agents, etc. In the food industry, these additives provide texture, body, consistency and stability to food products. In the cosmetics industry they are used as thickeners, stabilisers, suspending agents and film formers in creams, lotions or shampoo. Hydrocolloid compounds are usually available in dry powder form, which must be diluted in water to obtain the desired colloidal solution. 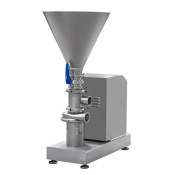 When these powders come into contact with water, lumps quickly form and it is difficult to obtain a homogeneous mixture using a conventional agitator. 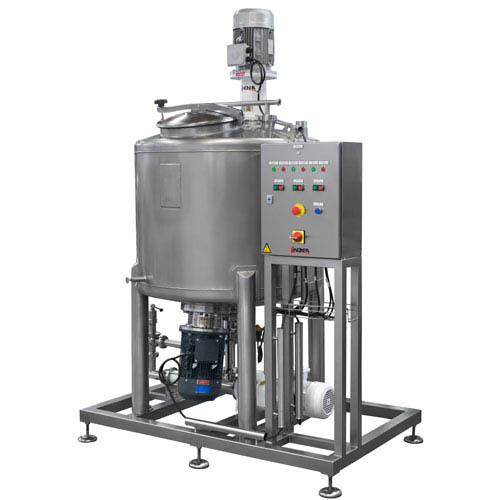 To overcome this problem, this mixing unit incorporates a rotor-stator mixer at the bottom of the tank that shears the product, thereby increasing the water-additive contact area. A cowles-type agitator fitted in the tank allows efficient circulation of the powder to the mixer lower head and also helps improve the dispersion time. When the process requires working with high powder percentages, the use of hot water can be an important factor as this allows the viscosity to be significantly increased. For such cases, the available options include a heating jacket and the replacement of the cowles-type propeller with another suitable agitation element such as anchor. 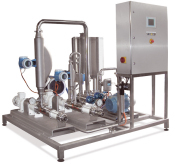 With its standard configuration, this equipment is prepared to work with products of up to 5000 cP. In case of more viscous products, this configuration should be adapted for this purpose. 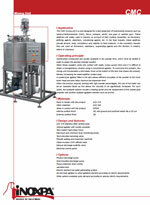 AISI 316L stainless steel vertical unit. Vertical agitator with cowles propeller. Maximum and minimum level probe. Powder adding and inspection manhole with safety sensors. Manual butterfly valves for disharge and cleaning. Pressure-vaccum valve for tank protection. Hot water generating system with electric resistance(-s) . Anchor-type agitator or other agitation element according to client’s requirements. Y-filter at the pump outlet.